Something I never thought I'd have to do when I first got pregnant was that I'd need to explain to the other kids in my daughter's class what's different about her. And honestly, after spending a month in preschool, I don't think the other kids see too many of the differences. 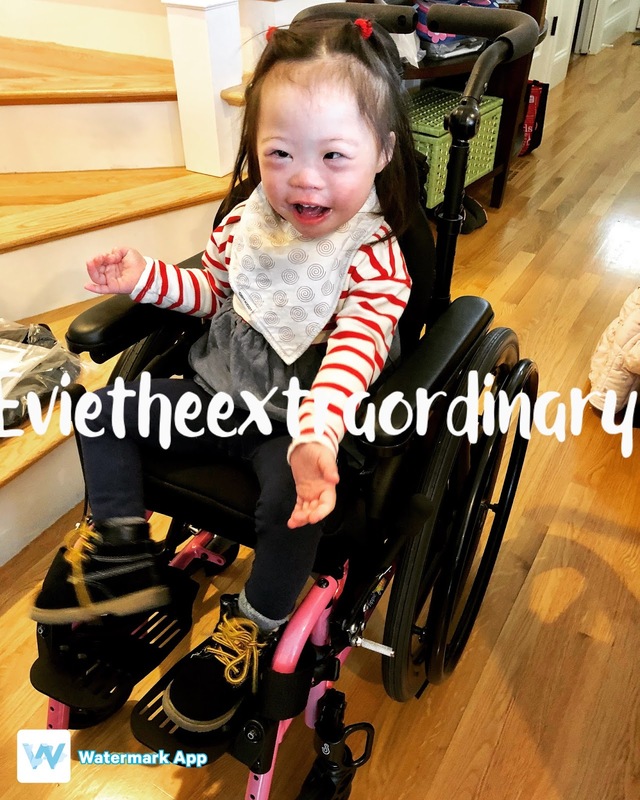 The letter is more for the parents, so they won't be caught off guard if a child goes home talking about a "plastic tube that goes into Evie's stomach," or asking why Evie has a wheelchair and a walker. 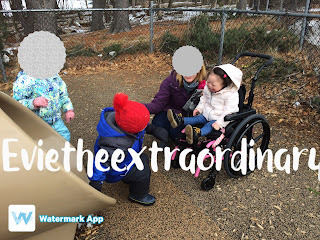 Our preschool team has been amazing, and one of their suggestions for the transition was to write a letter to the other families in the preschool class, explaining the g-tube in case the children asked about it. They put me in contact with another mom, whose tubie is now in 3rd grade and flourishing. So a lot of credit goes to this mom, who gave permission for them to send me a copy of her original letter, so that I wouldn't have to start from scratch. She provided the framework for me to explain g-tubes and Down Syndrome, as well as hypotonia. Our letter is below--I hope that it helps another DS mom entering preschool with a g-tube! We wanted to first of all thank you for your wonderful children, who have welcomed our daughter Evie with open arms. We have heard that her classmates are independently coming to play with her, patting her on the knee and telling her not to be scared, or announcing that “Evie is beautiful.” This has meant the world to us, as starting preschool for a child with disabilities can be daunting. This letter is to help you to understand a little of Evie’s special needs and what your child may see in the classroom, so that you can help your child to understand if they have questions. We are very open and happy to answer any questions or concerns you may have. 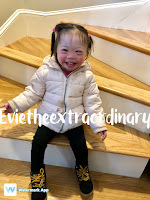 Evie has Down Syndrome (DS), which simply means that she has an extra copy of her 21st chromosome. 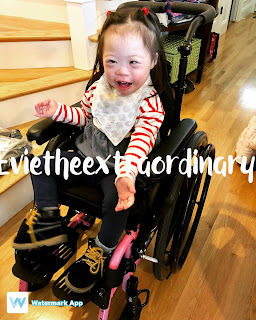 We call her Evie the Extraordinary, because she has overcome so much in her 3 years: 5 weeks in the NICU, open heart surgery for holes in her heart, eye muscle surgery, so many doctors’ appointments, and a feeding tube. Evie received a feeding tube at 5 weeks old because she did not have strength to eat. Your child may see the nurse or Evie’s aide attach plastic tubing and a syringe to a small port in Evie’s stomach to “drop in” some formula. We usually tell curious kids that Evie doesn’t know yet how to eat much with her mouth, so we have to give her “milk” through her tummy. Evie can eat pureed foods (i.e. applesauce, pudding, etc), but other textures like crackers are a choking hazard because she doesn't know how to chew or swallow thicker foods safely. She is learning to feed herself, and we are hoping that her classmates will inspire her to try this more! You may notice Evie’s purple walker or her pink wheelchair in the hallway, or her ankle braces for extra support. Walking is something that Evie is working on, because her muscles are weaker. She has a special chair in the classroom for more support while she sits. She is learning to use all of these tools to be able to get around like her peers. When she is tired, she will still crawl to get around. While Evie does not know how to speak much with her mouth, she knows more than 100 signs in sign language. She also uses a book of pictures that are specially made for her to be able to point to what she wants to say. Evie understands a lot more than she can express. She knows colors, letters, and is learning numbers. She loves books and singing, and definitely enjoys circle time. All of that being said, Evie is just Evie! She is not defined by her Down Syndrome. She is a feisty, affectionate, curious 3 year old girl who loves the Itsy Bitsy Spider, playing with blocks, and playing with playdough. 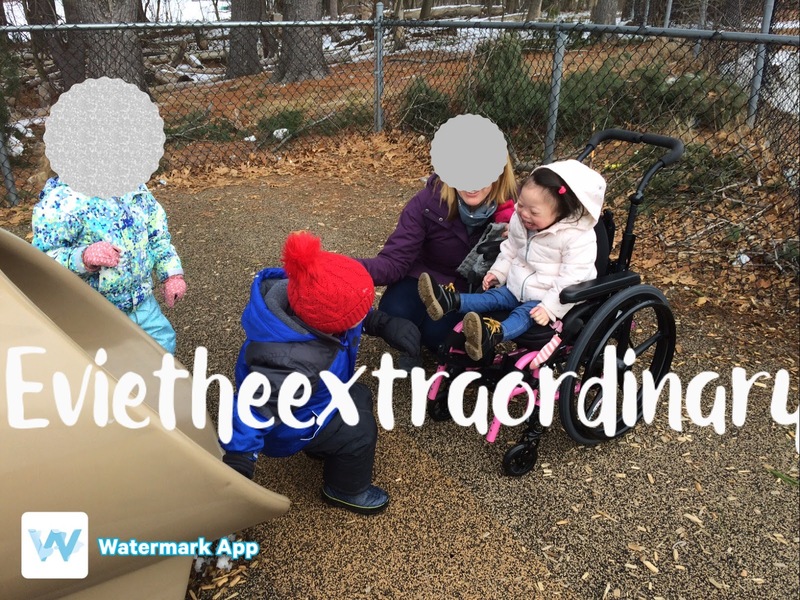 We are immensely grateful to Ms. X, the teaching assistants, and Evie's aide as well as her classmates who are helping to teach Evie new things. If you have any questions, please feel free to ask us. We are looking forward to getting to know all of you more! In case you wondering, after the letter was given to all the families, everyone made an effort to say hi to us, and acknowledge Evie when she arrived at school. It's a relief not to have to explain things over and over again, or receive questioning looks and wonder what people are thinking. We are grateful for a proactive preschool team!